Arctic is one of the most well-known manufacturers of heatsinks for both graphics cards and processors (as well as a popular producer of thermal paste and case fans). 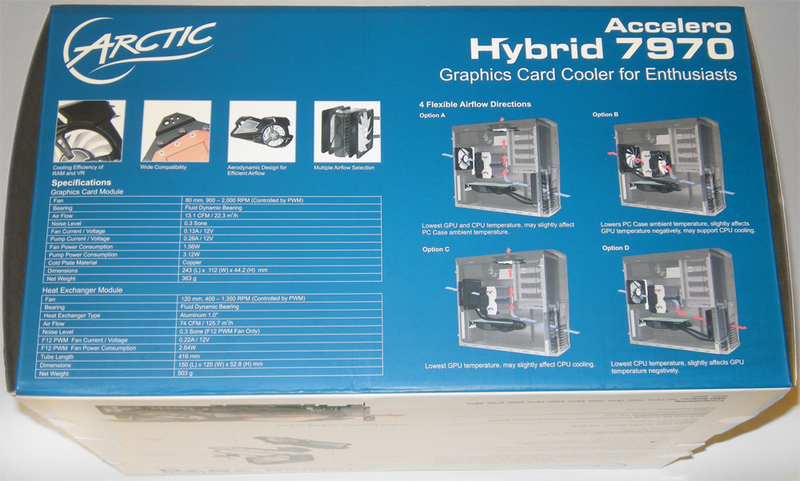 Today we will be taking a look at Arctic’s venture into a closed-loop cooling solution – the Accelero Hybrid 7970. 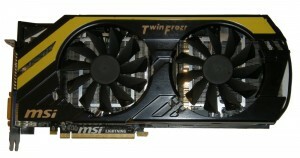 Supporting a dozen AMD video cards ranging from the HD 5830 through the HD 7970 (with some exceptions – also note there is a Nvidia compatible version) this cooler is set to be marketed as their flagship cooling solution. 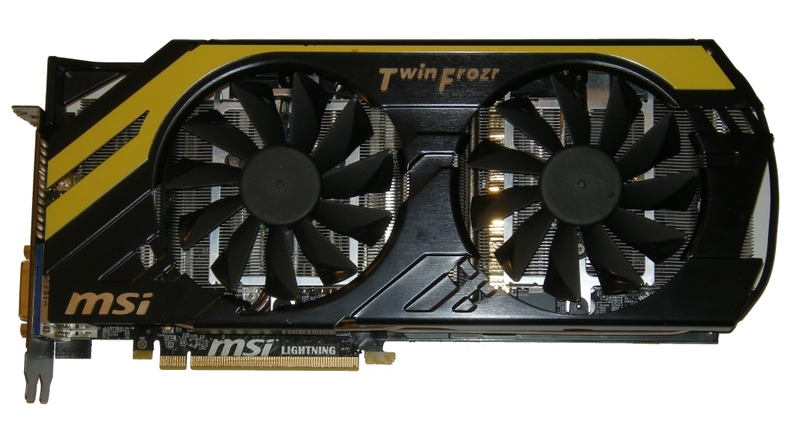 In this article, the cooler will be installed onto a MSI HD 7970 Lightning Edition, and then compared against other coolers (both reference and non-reference) from different manufacturers. The PWM fans are both controlled by the graphics card and work according to the GPU load which minimizes the noise level. The PWM setting can be modified according to the different performance and noise priorities. 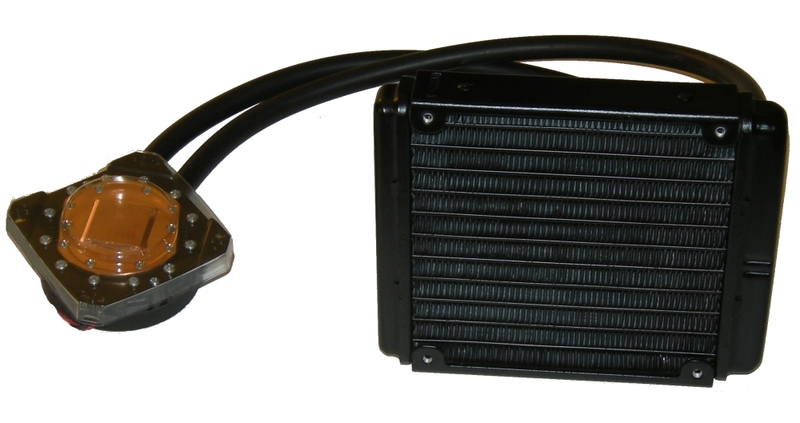 Unlike existing VGA LCS, this cooler is compatible to a vast range of AMD graphics cards. The Accelero Hybrid came in a thin-layer cardboard box, differing from the plastic clam shell I received for my last few reviews on their all-air coolers. While unboxing the product I could hear some rattling; it turns out some of the aluminum VRM heatsinks had sprung free from their plastic case, nothing was damaged though. Below are some images of the box and the product. 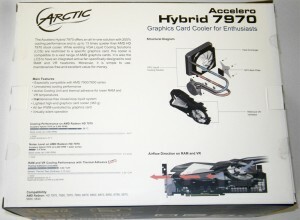 The installation for the Arctic Accelero Hybrid took approximately one hour and was not entirely an easy task. The printed instructions that came with the cooler were relatively clear on most of the installation process, but certain steps (e.g. : which holes/orientation to use for the spacers) would have been easier if the instructions were written in a more detailed/specific fashion. The biggest issue I had with the installation was attaching the waterblock/pump portion of the cooler onto the card by lining up then feeding small screws through the card and spacers. After 10 minutes of trial and error I asked my lovely wife to assist me with an extra set of hands and eyes to make sure everything lined up properly. After getting the screws through and tightening them down, the install was pretty much complete. Notes: The Lightning Edition already has a full-cover heatsink for both the VRMs and VRAM, so I did not install the included aluminum heatsinks onto the card. Also, because I run my system from a benching station without a radiator mount, I had to create a make-shift stand/setup for the radiator portion (so that it was not hanging off the side). In order to remain consistent with the other products used for comparison, I used Arctic MX-2. This will keep the variables to a minimum, and should isolate just the difference in performance between the comparison samples. For sound levels, the fans were set to 100% (or 12v). I used a sound meter to record decibel readings from two feet away. 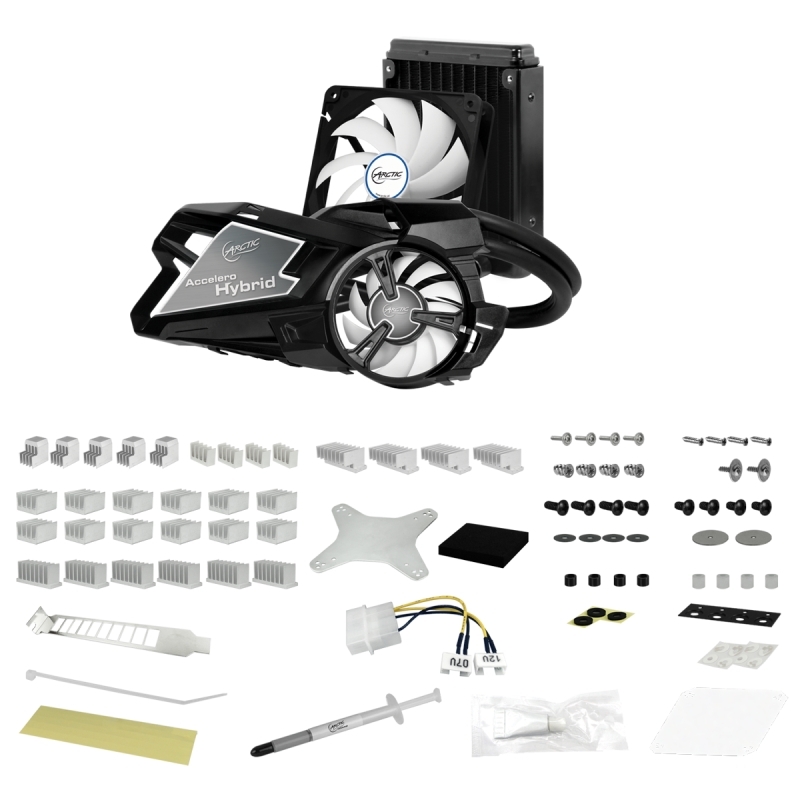 The competition for the Accelero Hybrid 7970 are the stock (reference) cooler, the Twin Frozr IV from MSI, and the aftermarket Windforce cooler. Also included are the results after swapping the included Arctic fan with a Panaflo Ultra-High speed (114.7 CFM) fan. Below are the results after running a full pass of Unigene Heaven with all settings on their maximum. The ambient temperature in the room was approximately 24 °C. As you can see from the graph above, the Accelero Hybrid performed very well in comparison to the Reference and the Twin Frozr IV coolers. The Twin Frozr IV’s unusually poor results surprised me enough that I re-mounted the cooler and re-ran the tests and received approximately the same results (+/- 1C) at the various voltage levels. 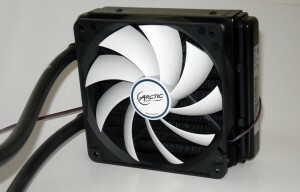 The Windforce cooler edged ahead of the Hybrid after hitting the 1.250 v mark, but at a significantly higher sound level, as can be seen in the following section. After replacing the included Arctic low-noise fan with a Panaflo “Beast” fan the temperatures dropped dramatically and no other available cooling option compared at any of the voltage levels. The sound levels for the available coolers were measured from 2 feet (~61 cm) away using a Tenma Sound Level Meter 72-935. 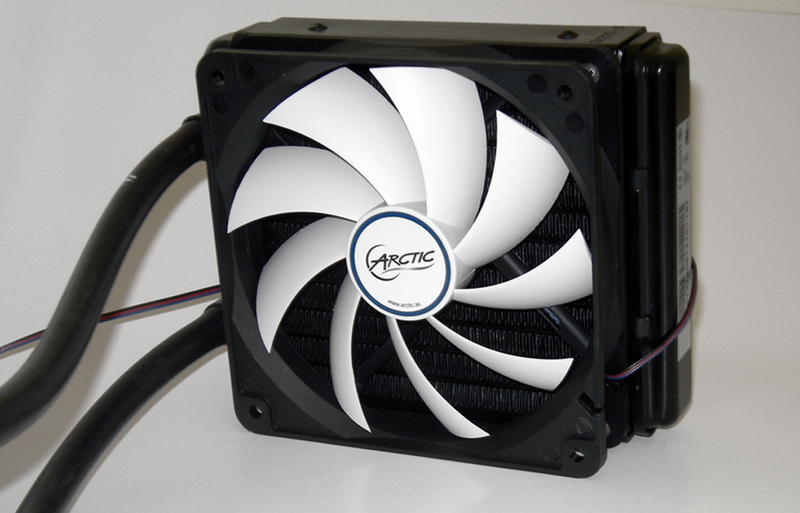 One of the main benefits to the Arctic Accelero heatsink line-up is the performance for the amount of noise created. I was unable to personally measure the sound levels of the Windforce and Reference coolers, so I checked around online for various reviews of the cards and found the Windforce to have a load dBA of 52 and the reference cooler 50.5 dBA – Note: from testing other reference coolers on different cards (non-7970) the dBA is usually in the low to mid 60s, so the number below may not be with 100% fan speed. 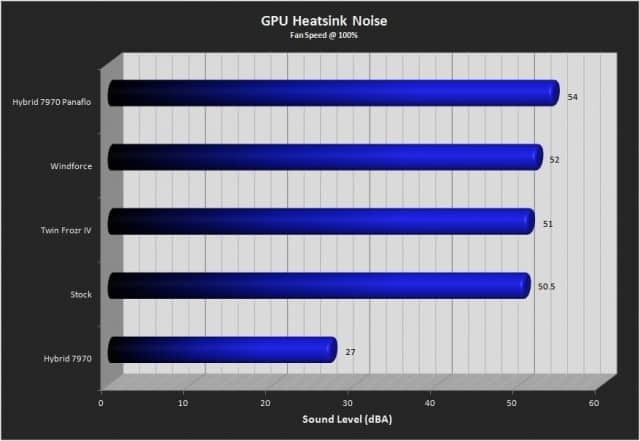 The difference in the results of the Hybrid versus the rest of the coolers is staggering, with the Hybrid 7970 being literally whisper-quiet according to decibel-level charts. I had to turn off the rest of the fans in order to have an audible sound to measure the included fan from Arctic. The rest of the coolers all fell into line reaching approximately the same noise levels. 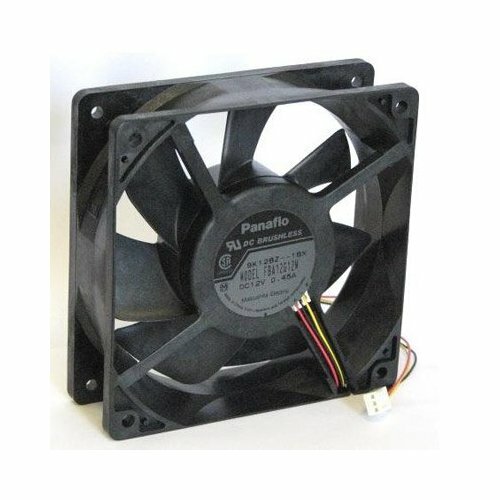 For sheer performance the Panaflo fan made a pretty large difference in temperatures over the bundled fan while having noise levels on par with competition. 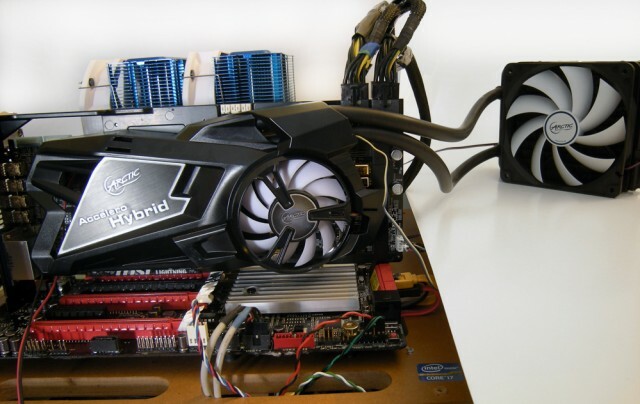 Overall the Arctic Accelero Hybrid 7970 GPU Heatsink does a very good job of keeping the GPU temperature nice and low while creating less noise than (most likely) all of the other fans in your case. The only catch is the steep MSRP of $180. Because of the high price, it is difficult to pinpoint who the product is marketed for; I would imagine many people who are considering spending upwards of $150 on a cooler for a computer part would likely purchase a full-cover waterblock from a company like Swiftech, EK, or DangerDen to be used in a full custom water cooling loop. On the other hand, as the closed-loop all-in-one water cooled CPU heatsinks have become quite popular (such as the H80 and H100 from Corsair) it appears to be about time for the GPU market to have similar products. I am interested to see how this product evolves and performs in future iterations; maybe with a dual-fan-width (120×2) radiator. 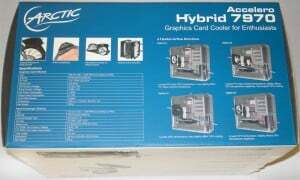 With that said, the fact this Hybrid is Arctic’s first dive into a closed-loop water cooling system, an overall lack of competition in the market, and it being their flagship cooler, a higher price would be expected. 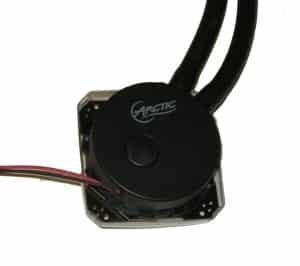 If you are a fan of Arctic’s products and have this kind of money to spend on a standalone heatsink for your graphics card, you will be hard pressed to find anything that is comparable without building your own water cooling loop. 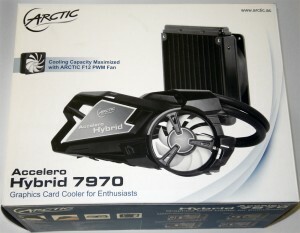 For those that want to stick to the strictly air-cooled market, Overclockers has yet to test Arctic’s Accelero Xtreme 7970 which, if past products are any sign of current performance, should also give excellent cooling for very little noise. 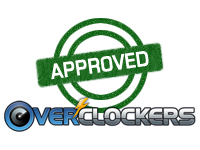 Ultimately, because the Accelero Hybrid 7970 succeeds in all of the performance tests with a whisper-quiet noise level, I give Arctic’s Accelero Hybrid the Overclockers Stamp of Approval, but I’d recommend checking to see if you can find it on sale. Special thanks to OnDborder and White Runner for helping collect data on the Reference and Windforce heatsinks. I expected a much better result from the Twin Frozr. Yeah I'm pretty confused by the results of the twin frozr. When I re-mount I will have to try it one more time (for a 3rd time) to see if the numbers change. I probably won't have time for a couple of weeks though as I will be moving next weekend. We should look for someone with a watercooled 7970, for him to compare his solution with Arctic's. The problem with a watercooled card is there are way too many variables. Pump, other things in the loop, radiator, fans, air flow, type of waterblock, length of the loop (if that matters) etc. From the looks of it, it is clearly just a repurposed (Asetek) Antec Kuhler 620 with a different copper base. a 620 can be had for around 60 dollars so what does the other 120 get you? a plastic housing to bolt on the waterblock/pump and a bunch of memory/VRM heatsinks? From the looks of it, it is clearly just a repurposed Asetek cooler with a different copper base. I guess you get the waterblock design. Ah thanks. I forgot that Asetek makes most of the stuff for other vendors. Yeah, the results for the Twin Frozr are kind of sad, but I think that's accurate. I have a lightning. 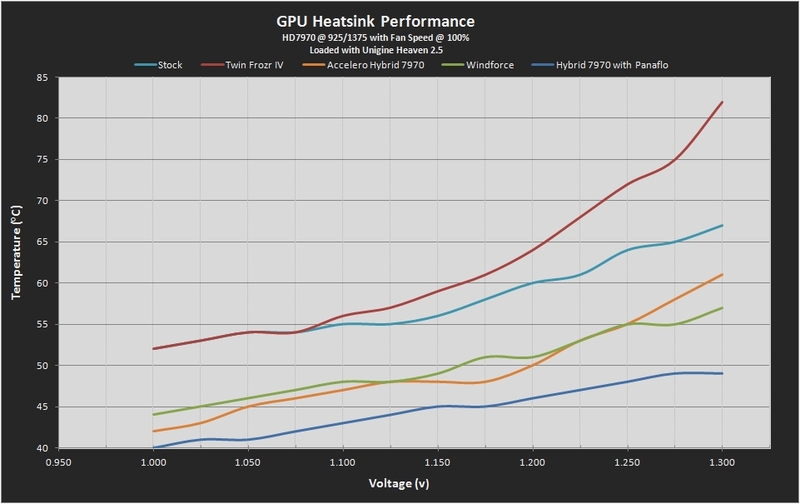 Stays nice and cool with stock voltage, but when I increase the voltage even a bit the temps soar (compared to stock). i would like to see alot thicker radiator on that bad boy, like double the thickness. 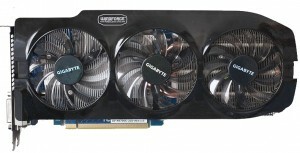 specially for 180$ same fpi though so quiet fans work. 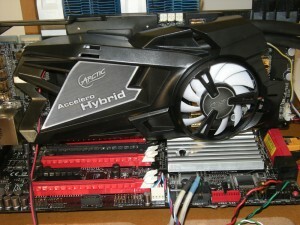 I'm sure it's too wide for standard SLI? Do you mean the thickness with the built-in heatsink? I believe it is approximately 2.5 slots, I figure to just call it a 3-slotter to be safe. Mostly, you get the mounting system to the the 7970, plus you get the built in spacer so it can actually touch the 7970's recessed core. Plus a bunch of RAM and MOSFET heatsinks and such. It does seem like an awful lot more money to pay for mostly the same stuff.